Lieutenant General Ludwig Leinhos, head of Germany’s Cyber and Information Space Command, told panel members at the Munich Security Conference yesterday that Germany would abstain from using autonomous weapons. 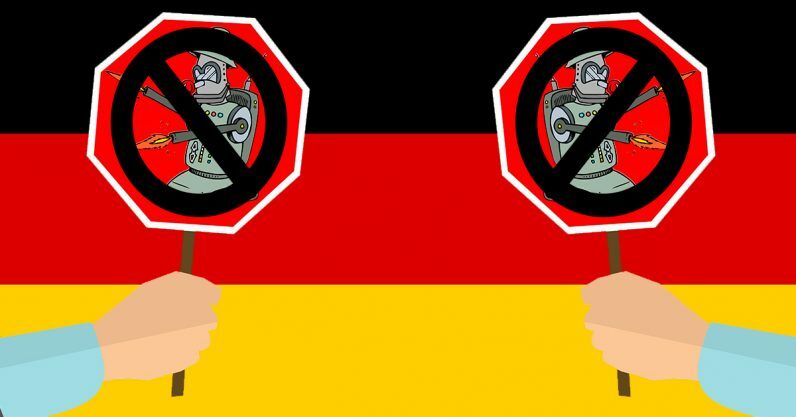 According to the “Campaign To Stop Killer Robots” Germany joins 22 other countries in pledging to keep AI-powered weapons off the battlefield. That leaves just 170 countries who’re either undecided or not interested in banning autonomous weaponry. We have a very clear position. We have no intention of procuring … autonomous systems. The big worry when it comes to autonomous warfare systems is that robots don’t have compassion. They can’t decide not to kill someone because they know it’s the wrong thing to do. Meanwhile, the Russian government wants to ensure its military has better killer robots than anyone else. The Kremlin has made it perfectly clear any attempts at banning autonomous weapons on a global scale would be met with refusal. And that’s terrifying. The UN and numerous organizations – such as the Campaign to stop Killer Robots – are doing everything they can to make sure humans stay involved in the people-killing process for the foreseeable future. It might be in our best interest as a species to support these groups, especially since 2017 wasn’t a very good year for the cause. If you’re among the lucky few who seem to think everything is going to be okay, we’d love to point your towards this horrifying portrayal of what a killer-robot infested tomorrow could look like. We’re careening towards a world where warfare means whoever’s population comes up with the worst algorithms gets slaughtered by millions of tiny murder-machines. Kudos to Germany for wanting no part of it.